Discover the rocky trails, sandy beaches and Berber villages of Morocco’s picturesque Atlantic coast on an easy-paced trek, and then immerse yourself in Moroccan life in Essaouira and Marrakesh. Trek with camels and then take the reins and try riding them! Morocco’s rugged Atlantic coastline is often neglected as a destination, but the beautiful long beaches, and rocky shoreline where Berber villages perch between desert and sea, offers delightful, easy winter trekking. Starting in Marrakesh you soon leave the bustling souks and palaces of the city medina behind and head west to the Atlantic coast near Essaouira. The weather here is always cooler and fresh but you are still under an African sun. Your trek begins at the former hippy village of Sidi Kakoui from where you trek southwards, following the coastline. The route takes you along pristine beaches and through the oak and argan forests that grow on the limestone cliffs nearby. As the trekking is gentle and easy-paced you will have plenty of time and energy to enjoy the surrounding sights. 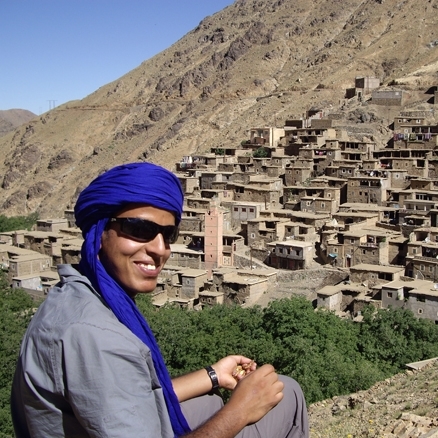 On the trail you will see places commemorating local saints known as Marabouts; villages where you may be invited to take tea with a Berber family; fishing settlements with wooden, hand-built boats dragged up on the foreshore; and lots of birds and wildlife. You are accompanied by camels on the trek, who carry your overnight essentials and luggage, and on the final day you will have a chance to try your hand at riding them. A team of cooks prepare traditional Berber food for you to enjoy in picnic lunches and in the evening, when you will eat your evening meal beside an open fire under the stars. After the trek you head north to Essaouira, a picturesque coastal town with ramparts, a busy medina and a working harbour. Here you will explore the port on foot, join a cookery class to learn how to prepare Moroccan dishes, and experience the delights of a traditional hammam. Finally, and hopefully fully relaxed after your immersion into Moroccan coastal life, you return inland to Marrakesh. A guided tour of the old medina and a final night out in this captivating ancient city bring your holiday to a close. Meal arrangements: Full board on trek, bed and breakfast in Marrakesh and Essaouira plus a farewell dinner on day 8. Fly to Marrakesh. Transfer to riad hotel in the Medina. Drive across desert to village of Sidi Kakoui. Trek to Oued Tidzi. End trek at Tafena and try camel riding. Drive to Essaouira. Hammam steam bath. Optional cookery class or morning at leisure. Guided tour of Essaouira. Transfer to Marrakesh. Guided tour. Fly back to the UK. Arriving in Marrakesh you will be met at the airport and transferred to your riad accommodation in the heart of the Medina. The journey takes about 15 minutes to get to the old city walls and your driver will get you as near as possible to your overnight accommodation. Riads are converted town houses in the old parts of Moroccan cities and are often down small lanes where no cars or traffic can get to, so often a porter will help you out with luggage and his small cart will be able to take luggage to the riad from the minibus. Riads are built with rooms facing out onto a central courtyard and a garden/pool which is open to the sky, this is for coolness in the heat of the summer. The windows open to the courtyard and there are no windows to the street, as that would be noisy and hot. Often the riad is a haven from the heat and bustle outside, with a terrace where you can relax and have views over the city and the High Atlas Mountains in the distance. In the evening there will be a chance to explore the Jamna el Fnaa square with its food stalls, orange juice sellers, story tellers and entrance to the surrounding souks. Day 2 - Drive to start of the trek at Sidi Kakoui - 3½ hours. Trek to near Oued Tidzi – 1 hour. Leaving your riad after breakfast you meet the guide and transport and start on the journey to the coast which will take about 3½ hours. As you leave Marrakesh behind, you encounter the edges of a dry, rocky desert near Agafay. There are no sand dunes here, but it has still been the location for various films such as the Prince of Persia. As you drive closer to the coast the landscape gets greener and more fertile with fields of wheat and poppies in spring and white limestone walls surrounding argan tree orchards. Near the town of Essaouira, the road goes south down the coast for about 20 minutes to the village of Sidi Kakoui with its cafes, long sandy beaches and oak and argan scrub on the dunes. Here, you leave your vehicle and meet your camel team near the wadi (seasonal river). When all the bags and kit are loaded on the camels you start your walk along the beach heading southwards. Today is just a short trek over relatively flat terrain, (with maybe small ascents for sand dunes) to reach the site where you will be camping above the Oued Tidzi ; a small river flows into the sea at this point although it is not always full of water depending on the amount of rain that has been falling. You arrive into your campsite for the night where your camp crew will have everything organised and ready waiting for you. The cook will serve your evening meal and you can get to know the team better around the camp fire. Distance: 3 km. Virtually no ascent or descent. Day 3 - Trek from Oued Tidzi to Aghbalou near Bizergane – 4-5 hours. After breakfast you continue along the coastline with no real ascent except for some small sand dunes along two beaches. As the heat of the day increases you will divert slightly inland to get some welcome shade while walking through coastal trees and small farms and fields. The coastal scrub will sometimes open out into argan trees and it is possible to see goats feeding on the argan nuts and comically climbing the trees to get the best crop. Descending from the scrubland to the beach you eventually reach the small cove of Oued Aghbalou where another wadi enters the sea. In this pretty location you will camp near the bay. Later, you may like to help the cook prepare the bread for the evening meal by heating flat stones and baking the bread in a sand oven. Distance: 8-9km. Ascent: approximately 60m. Day 4 - Trek from Aghbalou to Sidi Ahmad Essaih – 3-4 hours. Today's trek begins by following the coastline along a small path past the village of Ait Idir. Then you climb for around 160m as the beach terrain changes to a rocky coast and the trek follows a path above the low cliffs. The path here is mainly a mule track and is easy to follow as it winds through Berber villages of small houses built from the local limestone surrounded by fields. The trek passes the cliffs, with great views out to sea and then descends to Iftane Bay - a fishing bay where boats and nets are hauled up onto the beach when they are not out to sea. Passing the boats and a few buildings you continue along the beach to the marabout of Sidi Ahmed Essaih (a white painted shrine to a local saint). Distance: 9-10 km. Ascent: 160m-200m. Day 5 - Trek from Sidi Ahmed Essaih to near Tassila – 4-5 hours. This morning you head slightly inland to avoid the sea cliffs of the Taskssout-n-Tahra, passing a small village and then ascending to the plateau of Awgzmir, climbing up to about 200m. There is then a descent to the valley of Dou Oussaggawr with its argan forests and fields of barley. You continue onwards on faint mule tracks to a campsite near to the small village of Tassila which you reach by ascending and descending past stream inlets and coves. Distance: 8-9 km. Ascent approximately 250m. Day 6 - Trek to Tafena – 1-1½ hours. Camel ride - 1 hour. Drive to Essaouira – 1-1½ hours. Visit a hammam. It is just a short walk today to reach the end of your trek. You begin by trekking slightly inland again to avoid the cliffs as you descend from the plateau. Here you reach a track which will take you to the port of Tafena - a very small village next to a sheltered beach and cove. Your trek comes to an end here, but instead you hop aboard the 'ship of the desert' for a short camel ride up the coast. Alternatively you may prefer to relax on the beach for an hour or so before saying a fond farewell to your camel team and cooks. Your transport will then take you northwards along a small road, past Smimou, and onwards to the coastal town of Essaouira. You will have the afternoon at leisure and to settle in to your riad before visiting the local hammam. The Moroccan people have visited public steam baths since ancient times and a regular hammam trip to cleanse, socialise, relax and rejuvenate is still very much part of modern day life across the country. Distance: 3km. Descent approximately 100m. Day 7 - Morning at leisure or optional cookery class. Afternoon guided tour of Essaouira. Essaouira contains a medina or old town within its 18th century ramparts. It has a long history, from being a base to harvest the highly-prized purple dye molluscs in Roman times to a period of Portuguese occupation and onwards towards the fishing port and holiday destination it is now. Famed for its whitewashed buildings, annual Gnaoua music festival and cool weather when the rest of Morocco is like a furnace, the town has become a destination to enjoy with its beaches and medina. There is often a strong wind onshore that makes it a great spot for water sports. In the morning, you will have the option to join a local cookery class where you will learn about Moroccan spices and create your own culinary masterpiece, usually a tagine. This is bookable locally. Alternatively you can spend the morning at leisure. In the afternoon you take a walking tour of the town, visiting various sights in the medina, the ramparts and maybe also exploring the wooden boat building and fishing fleet in the harbour. The rest of the day is yours to relax, try out some watersports or explore further. Day 8 - Drive to Marrakesh - 3 hours. Guided tour. Farewell dinner. In the morning you will be driven back to Marrakesh, perhaps visiting an Argan oil cooperative on the way to see how the nuts are processed and to try a sample. The cooperatives are mainly run by women and they spend a lot of the day grinding the nuts to make a paste and oils. The oil is delicious with fresh bread and also can be made into various beauty products. After arriving in Marrakesh, you'll take a short break to freshen up before heading out on a guided tour of the souks and palaces of the old medina. Marrakesh is famous for its souks and it's not possible to visit everything in a short tour, however you should have a chance to see the main sights and perhaps do some haggling in the silver, magic or clothing souks. In the evening there will be a farewell meal in Palais Dar Es Salam, a traditional restaurant in an old converted palace. Day 9 - Group transfer to airport for flight back to London. Trekking along the rugged cliffs and beautiful beaches of the Atlantic Ocean was visually stunning and camel riding among the sand dunes was a memorable treat! Hussein was a fantastic guide, one of the best, and his organisational skills, knowledge and charm greatly enhanced our adventure. I enjoyed the company of our small but select group and I thought we slipped into a very comfortable team. Trekking with Mountain kingdoms is always a pleasure and a privilege.